The Headway elves have been on a winter holiday, and welcome you all in to 2018. We’re very excited for the year ahead. Our chairman, Jane Clark, said a few words of thanks to the staff and volunteers for their dedication to our service, and for their efforts to arrange yet another successful event. We were privileged to welcome our Patron, Steve Rider. He helped draw the raffle, for which we raised over £230 – congratulations to our winners! Following this, we all enjoyed an afternoon of musical entertainment; singing and dancing to the Bourne Again Shadows until it was time to leave. View pictures of this happy occasion here. What’s New, Headway South Bucks? Our Newsletter, of course! We’re bringing our trustees, staff, volunteers, friends, clients, and their families and carers a biannual update of the latest HSB happenings! A collaboration of past events, notable donations, and topical discussions from our Bourne End base. Have your diaries ready and waiting to save-the-date of our upcoming events. We have joined the forces of our re-launched social media, and national news from Headway UK to bring you the most current and relevant content. View or download the Newsletter here. Thank you – The HSB Team! 24th August 2017 - HSB Causing ‘Treble’ At The Musical Museum! On 24th August 2017, Headway South Bucks welcomed clients, carers, volunteers and staff to join them for a fun and educational experience at the Musical Museum in Kew. 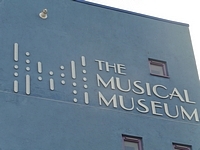 The museum presented a fascinating range of self-playing instruments, music rolls, and told the story of how people listened to music before the days of microphones and electronics. We learned how music was captured, instruments powered and experienced the sounds and actions of self-playing instruments throughout their evolution. We particularly enjoyed seeing the ‘Wurlitzer’ coming up from the ground onto the stage during the performance. All in all, everyone thoroughly appreciated their experience of original music entertainment from years ago, and getting involved in a historic music therapy session! Following our morning at the museum, we enjoyed a 2-course lunch at the Coach and Horses Pub. The food was excellent, and the staff looked after us very well. The day was another huge success for HSB, with clients and carers praising thanks to everybody that made it happen. Another “Lovely day out with good company” for HSB – it’s music to our ears! Read the report of this new initiative launched today by Prince Harry, on the Headway National website here. 15th July 2017 - Our Supporters Rock! We want to say a huge ‘thank you’ to the Hutchins family, friends, and talented musicians for their hospitality at Willow Wood Festival in Cookham, this Saturday. 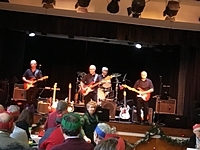 Everyone had a wonderful time, and thoroughly enjoyed coming together for an afternoon of family fun in support of the work that we do at Headway South Bucks. This charity is very close to the hearts of our hosts, and their friendship going forward is an invaluable asset to us. We can all agree that the event was a huge success, and the opportunity helped us to raise awareness of acquired brain injury and the support that we offer at HSB. We are absolutely blown away by the generosity of everyone that attended – a donation to our services totalling almost £2,000! Your fundraising efforts will allow us to run the resource centre, provide external therapists, and run activities ranging from arts and crafts to SportsAble. Your donation will enable us to support carers and families of those affected by brain injury, and help secure the future of our charity. We look forward to deciding how best to invest this contribution to benefit our clients moving forward. We are extremely thankful to our team of HSB trustees, staff and volunteers that represented us on the day, and to all their recruits! – we appreciate your hard work leading up to, and on, the day, and for sharing your wealth of knowledge and enthusiasm for the cause. 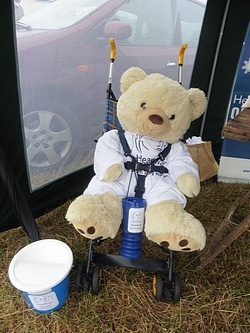 Thanks also to ‘Ted-way bear’ for getting on board, and collecting as many donations as he could get his paws on! HSB is one of several beneficiaries of Marlow Thames Rotary Club's significant fundraising initiatives - see Bucks Free Press online. With the money donated, Headway South Bucks, which provides support and services to those coping with brain injuries and damage, have already bought a large format iPad to help with neurological rehabilitation, ranging from brainteaser games and developing motor, visual and vocal skills. We are delighted about this donation and thank Rotary on behalf of all our clients who will benefit directly. View the interview on YouTube here. April 20th 2017 - Vist to Aylesbury to see "Ghost - the Musical"
Headway South Bucks recently went to see a live production of “Ghost the musical” at Aylesbury Waterside Theatre. We had a great turn-out of clients, carers, volunteers, and staff, and were all very excited for the day ahead. We chose a great day to enjoy coffee and a traditional 2-course pub lunch at “The Firecrest” in Wendover. We were even lucky enough to be able to sit outside and enjoy the wonderful sunshine before heading onwards. After a short journey to the theatre, we took our seats for the show. Inspired by the classic film, the timeless story of love, despair, and hope featured innovative reimagining and new music. It was a very powerful story, and wonderful to experience live. We all thoroughly enjoyed the performance, and were moved by the talented cast. Towards the end, we even joined in with a Headway rendition of “Unchained Melody”! Unfortunately, we were unable to take photos of us enjoying the latter part of the day, but please click here to view our photos.